Dinah Shore | New PR Words - and Music! New PR Words – and Music! 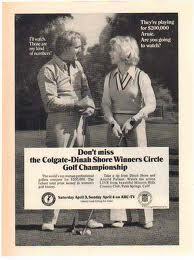 A print ad for the Colgate Dinah Shore Winner’s Circle Golf Tournament – With Arnie Palmer. I was there when it was shot. Today is four years since my dear mentor and stepfather John R. Walsh died. Two years ago I wrote a post about him that will give you some of his and our background. What I’d like to share with you in this post is some of his brilliant thinking and the lessons we can take in a Web 2.0 world from his ability to strategize before the Internet/World Wide Web. Next time you watch women’s golf and tennis think of John Walsh. Back in the 1970’s women’s sports had almost no corporate sponsorship. With no big money prizes and TV contracts there was very little interest. It occurred to John that this represented an opportunity for consumer products companies whose primary purchasing public was almost wholly women. He pitched the idea to Colgate-Palmolive CEO-at-the-time David Foster, who passed away recently. Foster, who happened to really like women and golf, thought it was a great idea and the Colgate Dinah Shore Winner’s Circle Golf Classic was born. Foster even bought it a home – the Mission Hills Golf Course in Palm Springs. Its success also helped to increase sponsorship of women’s tennis. Walsh and Foster boosted the careers of LPGA Hall of Famers JoAnne Carner, Nancy Lopez and Amy Alcott among many others. The two pretty much put the sport on the map. The fabulous PR strategy still puts Colgate-Palmolive in a positive spotlight today. John’s big strategic idea: Great opportunities are out there. Look for an audience that can get behind something that already exists and is just waiting for support from a logical booster. He did the same thing with Cutty Sark Scots Whisky, selling its global distributor and the Men’s Fashion Association to collaborate on a men’s fashion awards program at a time when there was no recognition for menswear designers. The Cutty Awards ran for years, garnering untold media attention for all and boosting the early careers of such fashion icons as Gianni Versace, Alexander Julian and many others. In the days of Web 2.0 and online search, it’s actually much easier to come up with winning matches like these. If you click the link at the top of this post it should bring up your audio player and a music file of John singing and playing one of his own compositions, “I’m In Love With San Francisco.” As I explained in my 2009 post, John played a mean piano – in the key of C only – and composed some wonderful songs. A man of words, he was his own lyricist. Unfortunately, John’s songs remain unknown. I’m happy to give one of them some airtime here. The song was recorded to digital from an old cassette tape using an iPhone 4s so the quality isn’t great, but it’ll give you a peek at one other part of his creative heart and mind. Here’s to one of the greatest winners I’ve ever known. Love you and miss you, John. Visit my website to download free inbound marketing fact sheets, ebooks and whitepapers! Enter your email address to follow my blog and receive notifications of new posts by email. Thanks for your support!